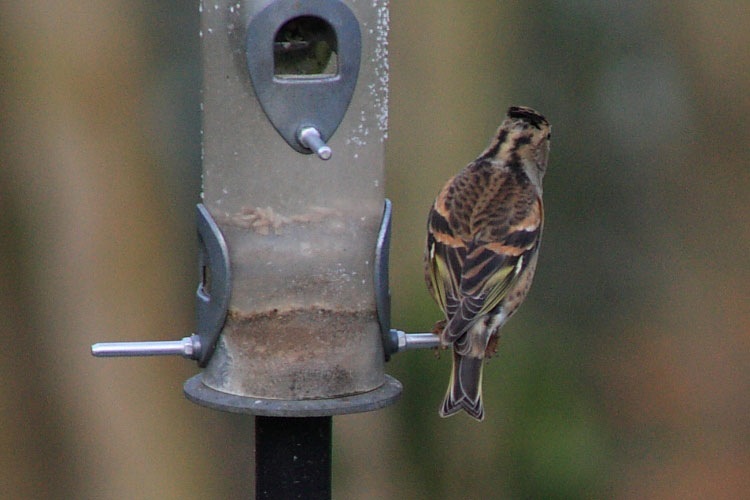 This being the weekend of the RSPB’s Big Garden Birdwatch, we’ve been doing quite a lot of bird feeder filling and staring out of our windows at the resultant flocks of feathered friends. 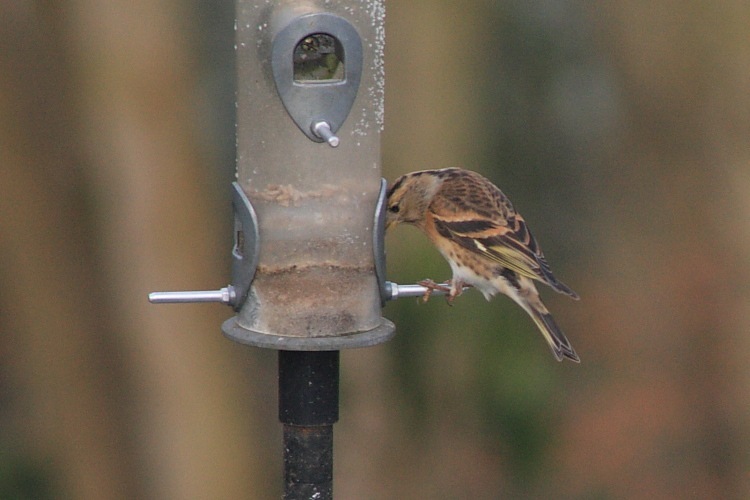 In fact, on Friday, not being above bribery, we even invested in a new niger seed feeder in the hope of encouraging our visiting Goldfinch to stick around. 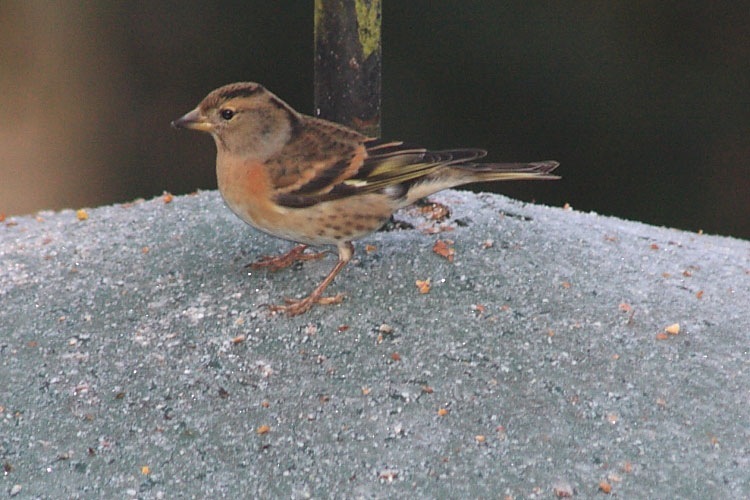 The niger seed feeder is a different design and it seems to have confused most of our feathered friends; they’ve been flying around it, sometimes landing on the perches, staring at it with the avian equivalent of a puzzled expression and then flapping straight back off to the sunflower seed feeder empty beaked. As luck would have it, the ever hawk-eyed Carol spotted something a little different this morning during our first Sunday window-gazing session. In our somewhat limited experience, it initially looked most like a female Chaffinch gone wrong. We consulted the field guide. 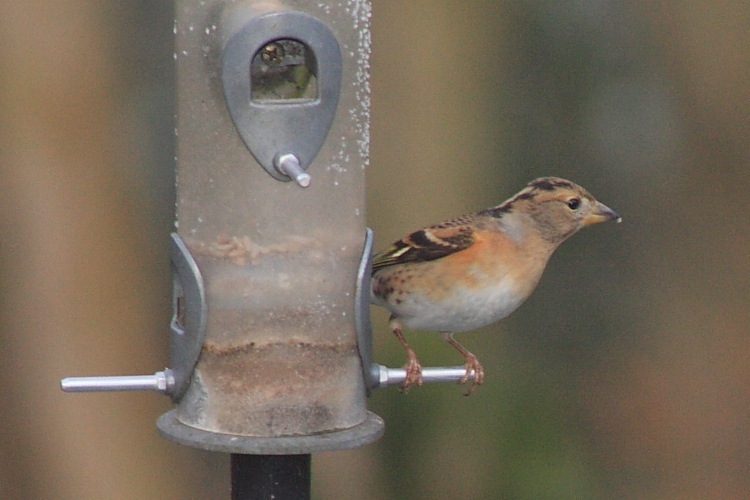 Fortunately, on the same page as the Chaffinch and right beneath it was the obvious culprit: our new visitor seemed to be a female Brambling. [Ed: Sounds like something you should be making into jam, really, doesn’t it?] Bramblings are almost exclusively winter migrants from good ol’ Scandinavia (again) and are sometimes referred to as the Chaffinch of the North, according to Birdguides. I hope no pretentious artist builds a humongous statue of one beside the A1 near Gateshead. 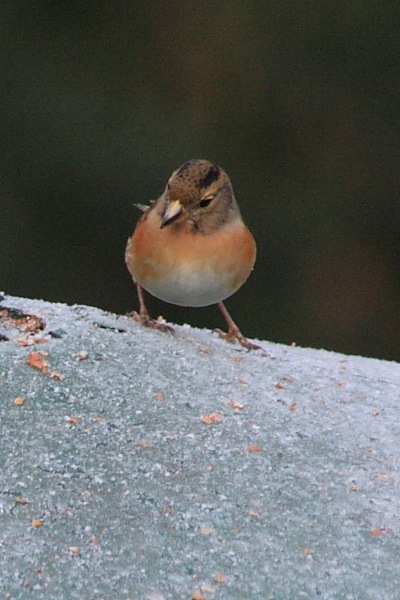 At least others must have thought Chaffinches and Bramblings looked similar, too. Unfortunately we haven’t spotted a male (which has a blacker head) but we were very happy to have been window-gazing when this delightful lady turned up. Here’s a few shots at various angles to show the colours and markings. Our Goldfinch came back later and finally seems to be getting the hang of the niger seed feeder. Excellent!